Slice-of-life, its a genre of anime, but it’s also something more than just that, its a moment of life captured forever. What most slice-of-life series do is by and large a rinse and repeat formula that dozens of series have used. Little Busters is one slice-of-life that is far less ordinary. There is something deeper in Little Busters, beneath the daily lives of these crazy kids is an idea that transcends the genre and innovates in ways that both shock and surprise, for better or for worse. Riki Naoe is a pretty normal kid except for the fact he has chronic narcolepsy and can fall asleep at any given moment. This looks to be the main hook for Little Busters but once again things go far deeper than that. The main plot revolves predominantly around a group of friends who call themselves (yep, you guessed it) the Little Busters. The groups leader is in his final year of high school are ready to ship off to live his adult life once the school year winds to a close, he has one last wish for the Little Busters, to make a baseball team. Its a standard set-up for a slice-of-life and gives way to a whole gaggle of characters to role on in and join the Little Busters. Unsurprisingly the series doesn’t exactly feature all too much baseball, it has bigger things on its mind. That’s where the genius of Little Busters lies, but it is also the thing that could make or break it, depending on your tastes. While on the surface the usually slice-of-life tropes are playing out, they are underscored by an ever growing presence waiting to turn all of those tropes right on their head. What exactly that is however is a matter of great mystery, on that slowly unravels all the while weaving further mysteries into the silk of the tale. A question is asked very early on in the series about the secret of the world. What exactly that secret is proves to be a matter of great importance to the Little Busters series and its mythos. What really stands out here is the particularly deep mythology that belies this series. Rarely does a slice-of-life anime come with such a mythos and it is one that builds with each passing episode. The more characters we are introduced, the more we come to understand the slightly off world these characters live in and their hopes, dreams, pasts and future, the bigger the series’ universe becomes. While certain aspects of all this may serve as an annoyance for those looking for a more straightforward, no extra attachments kind of slice-of-life series. However if you are the type of viewer that is in the market for something complex and thoughtful, Little Busters may just have the flavour your taste buds are hankering for. This particular collection of the first season of Little Busters ends on a pretty significant cliffhanger, leaving some major plot threads hanging loose. It is one hell of a way to leave viewers eager for some more helpings of Little Busters and it concludes what amounts to a great release from Hanabee. The aesthetics of Little Busters hearkens back the feel of series like Kanon and Clannad, both series from the same original author as Little Busters so that is no real wonder why they come across to similarly in art design. The animation here is a fluid slipstream of colour and motion that brings these characters and the world to life in spectacular fashion. Furthermore Little Busters features a great score composed of an array of varied and distinct musical compositions that complement the action on screen with ease and finesse. The series opening and ending themes are also quite good, but unlike the incidental music, both tracks don’t leave too much of an impression or impact. 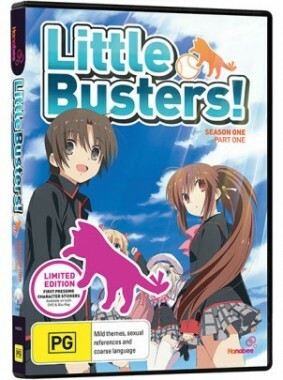 This release of of Little Busters features both an English and Japanese dub of the series. The English dub was produced by Sentai Filmworks and is a bit of a mixed bag. Some of the casting is brilliant, some of it is flat-out awful. This is sadly far from Sentai Filmworks best dubs and Shannon Emmerick is painfully miscast as Riki Naoe. Rounding out this solid release are some bonus goodies that Hanabee have bundled into the package. While there isn’t really any on disc bonus content, Hanabee have packed in some lovely stickers adorned with artwork of several of the series female characters such as Rin and Kamori. This is a nice little extra to add in for anime fans. It is something a little bit different from the norm and it is all the more appreciated for it. It is a quite a good way to round out the release which would otherwise be rather bare-bones. Little Busters is far from your average slice-of-life series. In fact Little Busters is dead set extraordinary. Unfortunately it is the things that make Little Busters so unique that may serve as a deterrent for some looking for a more traditional slice-of-life fluff-fest. However if you want a little bit more to think about in your slice-of-life anime, Little Busters is more than capable of providing viewers with a heaping helping of food for thought. 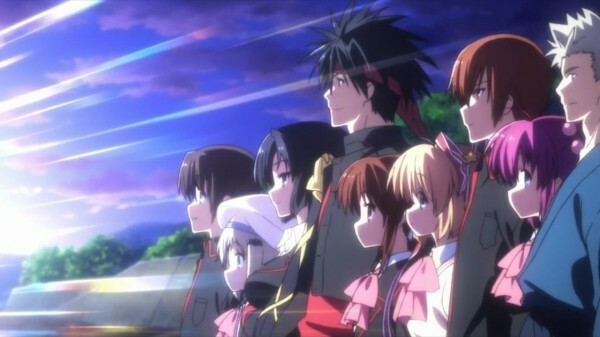 The cast, the world, the story, the moments captured in time, all of it makes Little Busters something truly special. It is quirky, intriguing and built around a heart of gold, Little Busters may very well be the most important slice-of-life anime of this generation, only time will tell if it reaches the heights that its excellent first cour promises. 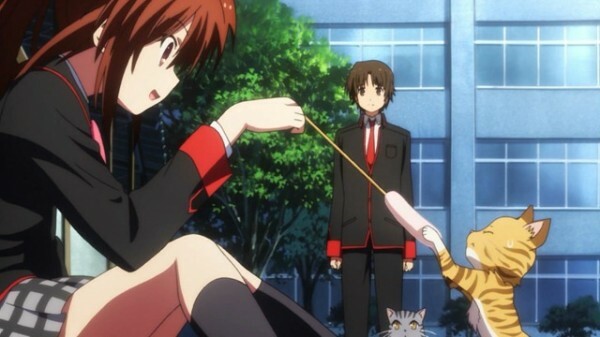 Little Busters is a truck load of fun and definitely an anime series that should be on any anime fans radar. 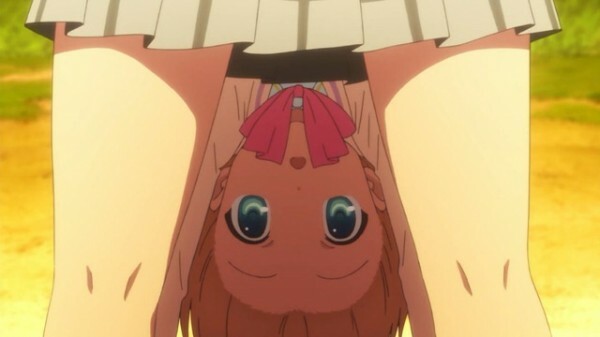 This one tasty morsel of anime you just have to try. Now that is some tasty anime.